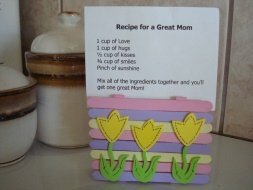 This Easy Recipe Holder is a great gift for the women in our lives! It doubles as a functional craft AND a card for that special lady. Great for Mother's day for preschoolers on up! 1. Paint your craft sticks and clothes pins, any color you wish! 2. Once the paint is dry, place your clothespins beside each other a few inches apart. Put glue along each clothespin and glue 8 craft sticks on one side, and 8 craft sticks on the other side. 3. Once the glue is dry it is time to decorate your recipe holder. We used foam flower stickers, which you can buy for $1-$2 at a craft or discount department store. Use any decorations you have, paint something or just leave it as is. 4. Now it's time to write out your special "recipe". We wrote a special recipe for Mom. Write your own to suit, or cut and paste ours, print it out and insert it into the clothespins of your recipe holder. Mix all the ingredients together and you get one great Mom like you!